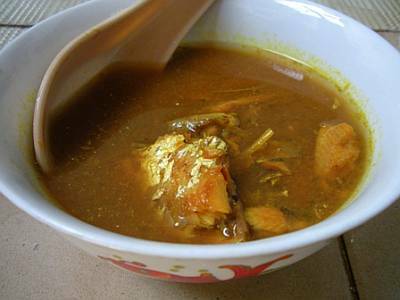 1) Break up the belacan and put into a large soup pot, together with two cups of water. 2) In a bowl, add one cup of water to the tamarind pulp. Squeeze tamarind and pour the juice into the soup pot. Repeating seven to eight times until the “juice” coming out is clear. 4) Add lemongrass and turmeric powder. Add the chili powder or red chilies here, if desired. Stir. 5) Bring to a boil, then leave to simmer for at least an hour. 6) Add salt and chilli powder to taste.